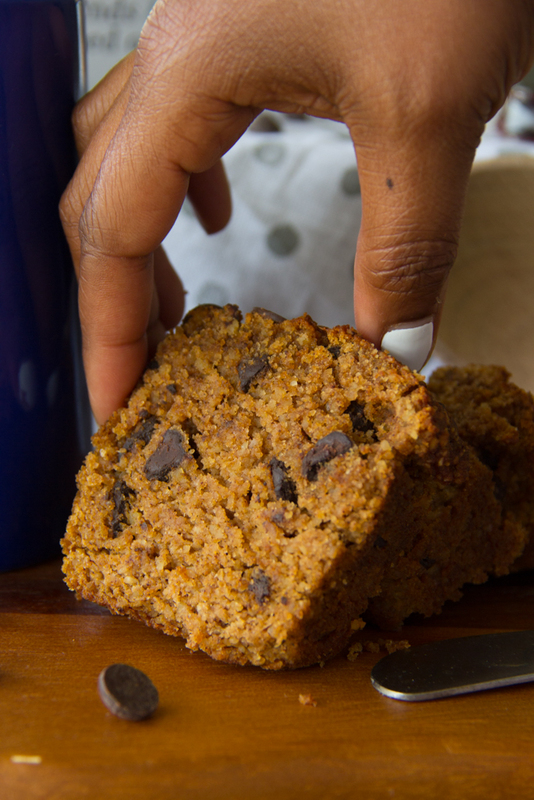 This tasty Petite Paleo Chocolate Chip Pumpkin Bread Recipe is tender, full of flavor, super simple to make and will keep the entire family begging for more. Happy September! The air is brisk, the kids are all back to school and it’s now time for all things pumpkin to overwhelm fill us! 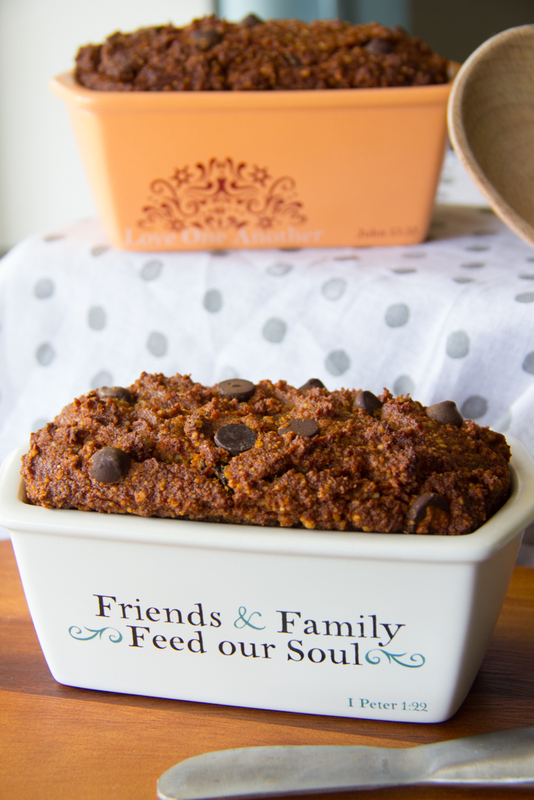 I thought I’d kick off the nonofficial fall season with a Petite Paleo Chocolate Chip Pumpkin Bread Recipe. I got it from my dear friend, Jay over at Jay’s Baking Me Crazy. 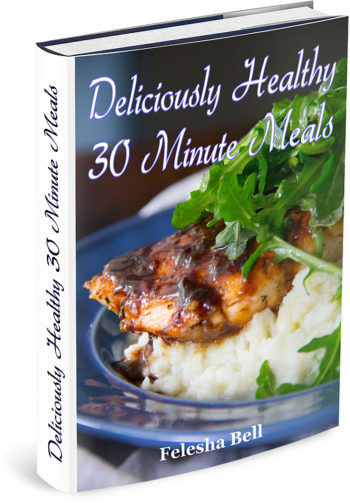 She does all things paleo so very well and we weren’t disappointed one bit with the outcome. 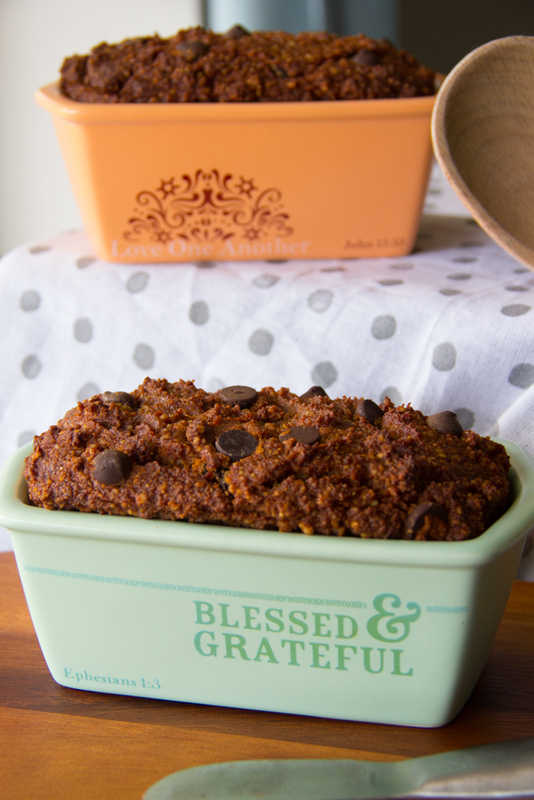 I baked this Petite Paleo Chocolate Chip Pumpkin Bread Recipe in my new Petite Bread Loaf dishes, which are available now over at the store. These Petite Bread Loaf dishes all feature an encouraging word and scripture on the outside and they come in some fun colors too. Check them out as they are super adorable and make awesome gifts for your baking friends and you can also get them the best bread maker from these bread maker reviews so they could bake all they want. Oh and I’ve stocked up the store with some other kitchen items that I’m sure you’ll love as well. Remember that I was raised on sweet potato everything but it’s nice to switch things up every now and then. 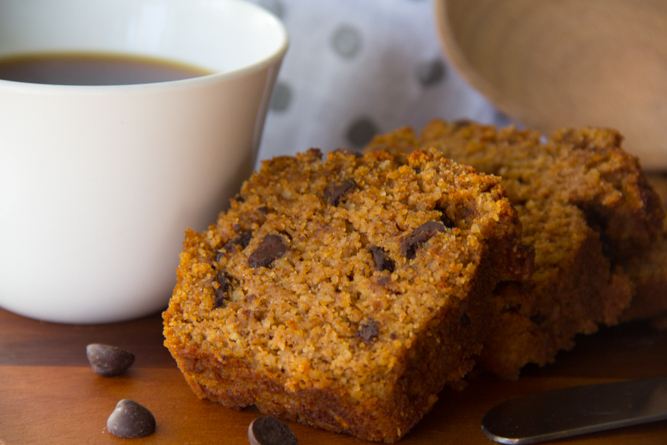 This Petite Paleo Chocolate Chip Pumpkin Bread Recipe is made with no refined sugars, no flour so it’s gluten free and yet it has great flavor. The whole family enjoyed it with coffee over the weekend. It’s loaded with the popular fall flavors of warm pumpkin spice, cinnamon and of course the obvious, DARK CHOCOLATE!! Notice that I didn’t include nuts for the first time. Sorry Momma!!! Feel free to add them if you wish for the added crunch! They are simply a breeze to make as all of the ingredients are combined into just one bowl within 10 minutes. How easy is that?!?!? Hubby walked in and said “Smells great in here!” It took great efforts for me to make him wait for me to take the pics first. There were almost no pics to post for you. Lol!! Are you feeling overwhelmed and stressed? God reminds me that when I’m overwhelmed or stressed that I need to rely on trusting Him more to alleviate the stress. Proverbs 3:5 reads “Trust in the Lord with all thine heart; and lean not unto thine own understanding.” If you’re finding yourself in a position in which you’re overwhelmed or stressed about what to do in a particular situation, begin to trusting God more on it. Know that He has the perfect plan/solution just for you to see you through. Say Grace and enjoy!! Preheat oven to 350 degrees. Line two petite bread loaf dishes with two parchment strips each. In a medium bowl, combine first six ingredients until mixed well. Add canned pumpkin, eggs, maple syrup, coconut oil and Say Grace Vanilla Extract. Mix well until everything is incorporated. Divide batter between the two dishes evenly. Bake for 50-55 minutes or until the center springs back from your touch. Keeps best in fridge. Say Grace and enjoy! This bread looks so perfectly moist and delicious! That it was Susie!!! Thanks for stopping by! ? This recipe looks delicious. Would make a nice hostess or holiday gift. Thanks Ellen!! This bread in the cute loaf dishes make a great gift for that special someone. Thanks for stopping by! Although I do not want summer to come to an end (we had the worst summer weather ever), PUMPKIN season is my favourite of all. This looks and sounds delicious….and I know I would love it. For sure, Chef G! Hey, there’s always a chance for an Indian Summer!! We have a hurricane barreling down our throats — so yes, I am a little stressed right now. I was actually planning on doing some therapeutic baking before the winds knock out the power… This looks like the perfect comfort food. Praying for you and all the residents dear heart! Peace! Be still! In Jesus’ Name! 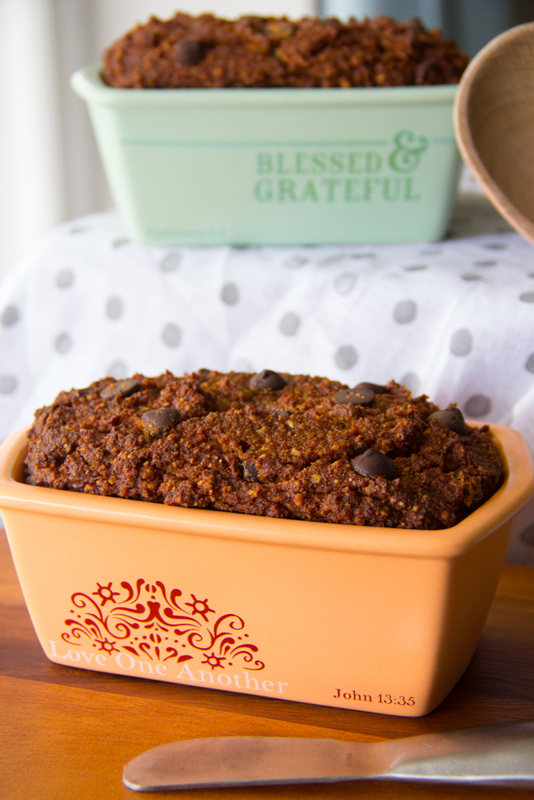 Hey girl Just wanted to say this recipe was so good it replaced my MILs normal SUPER unhealthy Pumpkin bread recipe (basically a pound cake) and everyone loved it! From one food blogger to another, you nailed it with this recipe!